See what unexpected finds emerge. I have found many psyllids, and learned a lot in 3+ years of field work. A somewhat common psyllid that feeds on Ribes aureum in Idaho. I have not focused on photos quite as much as in aphids, and I have not worked on learning the taxonomic literature and identification of psyllids. In fact, I have been slide mounting everything (yes, I know, psyllid taxonomists don’t like that fact), sorting immediately to family, and then sorting later into what seem like reasonable species and generic groupings, the latter with almost no information about the established psyllid classification. I set out to do this as a fun exercise — to see if any classification I arrived at for my specimens mirrored (or not) the classification that already exists and has been built over the last century plus. All of this is work in progress that goes slowly because I have little time to devote to it. 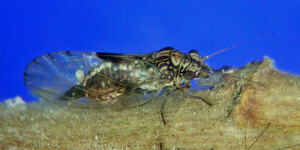 As I have psyllid stories to tell, I will post some here.